Are you in the market for a 64-slice CT scanner? Do you like the idea of purchasing a refurbished one so you get more bang for your buck? There are two great ones on the market and while they have a lot in common, there are some factors that set them apart. 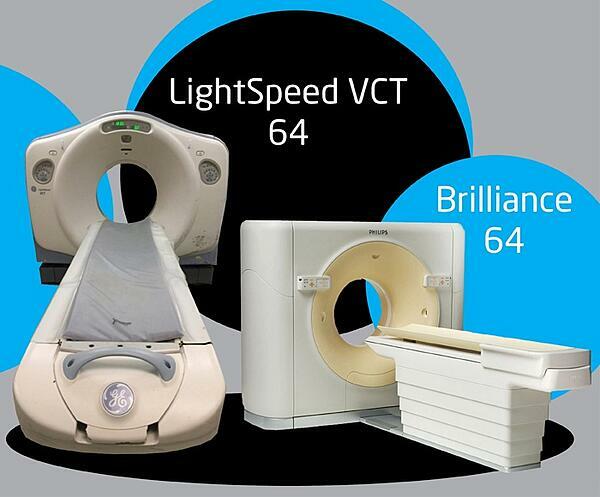 We’ve taken a close look at the Philips Brilliance 64 CT and the GE Lightspeed VCT 64 CT and prepared this comparison to help you determine which CT scanner is right for your practice, clinic, healthcare facility or hospital. First, let’s look at how they are alike. Both are 64-slice CT scanners and are eligible for cardiac scan reimbursements. The big difference between the two systems is the cost of owning and operating the system. For example, Philips Brilliance 64 tubes last significantly longer than VCT tubes, with the MCR 800 tubes used in Brilliance scanners lasting between 600,000 and 1,000,000 scan seconds—but we’ve heard of tubes lasting .6 million scan seconds! The tube lifespan for the VCT is only 300,000-500,000 scan seconds—a significant difference! That said, the VCT tubes only cost around $150,000 new from an OEM versus about $193,000 for the Brilliance 64 tubes. On the secondary market, VCT tubes with low and moderate use average 30% lower than those for the Philips Brilliance 64. Another difference between the two systems is XR-29 Compliance. The VCT 64 systems are compliant, but the Brilliance 64 will require an upgrade from Philips. So what about the cost of the actual system? With comparable age and condition, most of the time the Brilliance 64 will cost less than a VCT 64. However, service costs usually are much lower for the VCT 64. Why? Because there are more trained service personnel, third party parts suppliers and after-market tube options. Then it’s time to talk to an expert at Atlantis Worldwide. We can help you review the specs, crunch the numbers, discuss your needs and review your budget. Together we can find the right CT scanner for you. Contact Us Today!